This is the small disc pendant - just 1.5cm across, perfect for a word that inspires you. 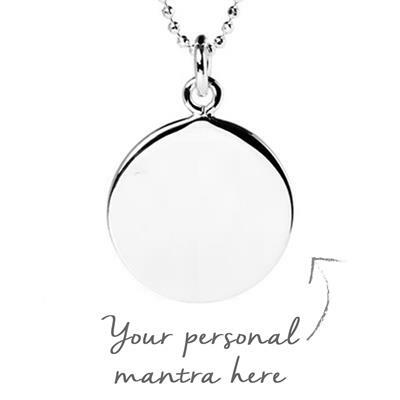 If you have a longer phrase, choose a larger 'myMantra' pendant which take a whole sentence. Have your very own inspiring word engraved onto this small pendant, so you can bring it to mind in the middle of a busy day or at a frustrating moment, to lift your mood and focus your attention. inspiring mantras - ideas for personalised necklaces. The Sterling Silver pendant comes with a 45cm diamond cut ball chain.